Saltykov-Shchedrin, Portrait by I.N. Kramskoi. Mikhail Yevgrafovich Saltykov (Russian: Михаил Евграфович Салтыков) (January 27, [O.S. 15 January] 1826 in Spas-Ugol village, Tver guverniya – May 10, [O.S. 28 April] 1889 in Saint Petersburg), better known under his penname Shchedrin (Щедрин), was a leading Russian satirist of the nineteenth century. At the invitation of the poet Nikolay Nekrasov, he acted as editor of Sovremennik, the Contemporary, and later, together with Nekrasov published the Otechestvenniye Zapiski (Notes from the Fatherland), a successor literary journal to the Sovremennik. In the tradition of Nikolai Gogol and numerous other nineteenth-century Russian authors, Saltykov-Shchedrin wrote a number of satires whose purpose was the reform not only of society but the moral failings of the Russian people. A scion of the ancient Saltykov family, Mikhail Saltykov was born on his father’s estate in the province of Tula. His early education was completely neglected, and his youth, owing to the severity and the domestic quarrels of his parents, was full of the most melancholy experiences. Left entirely to himself, he developed a love for reading; but the only book in his father’s house was the Bible, which he studied with deep attention. At ten years of age he entered the Moscow Institute for the sons of the nobility, and subsequently the Lyceum in St Petersburg, where Prince Lobanov-Rostovsky, afterwards minister for foreign affairs, was one of his schoolfellows. While there he published poetry, and translations of some of the works of Lord Byron and Heinrich Heine. On leaving the Lyceum he obtained employment as a clerk in the Ministry of War. In 1854 he published A Complicated Affair, which, in view of the revolutionary movements at that time in France and Germany, was cause for his banishment to Vyatka under the conservative regime of Nicholas I, where he spent eight years as a minor government official. This experience enabled him to study the life and habits of civil servants in the interior, and to give a clever picture of Russian provincial officials in his Provincial Sketches. The Contemporary was a leading Russian literary, social and political magazine, published in St.Petersburg from 1836–1866. The magazine published poetry, prose, critical, historical, ethnographic, and other material. It originated as a private enterprise of Alexander Pushkin who was running out of money to support his growing family. To assist him with the magazine, the poet asked Nikolai Gogol, Pyotr Vyazemsky and Vladimir Odoyevsky to contribute their works to the journal. It was there that the first substantial assortment of Fyodor Tyutchev's poems was published. A few years later the magazine fell into decline, and Nikolay Nekrasov and Ivan Panayev took it over in 1847. It was Nekrasov who really made the magazine profitable. He enlisted the services of Ivan Turgenev, Ivan Goncharov, Alexander Herzen, and Nikolai Ogaryov. The Sovremennik was the first to publish translated works by Charles Dickens, George Sand, and other best-selling foreign writers. During the reactionary reign of Nicholas I, the journal had to struggle against censorship and complaints of disgruntled aristocracy. 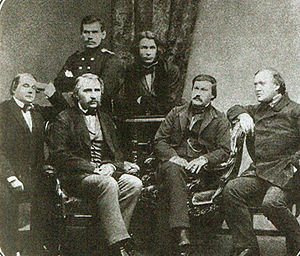 Most popular contributors to Sovremennik in 1856 (left to right): Ivan Goncharov, Ivan Turgenev, Leo Tolstoy, Dmitri Grigorovich, Alexander Druzhinin, and Alexandr Ostrovsky. In 1863, Nekrasov invited Saltykov-Shchedrin (stayed until 1864), Maxim Antonovich, Grigory Yeliseyev, and Alexander Pypin to join its editorial staff. Controversy among the members of the editorial staff soon resulted in adoption of a more temperate policy. In 1863–1866, Sovremennik published Chernyshevsky's What Is To Be Done? (written in the Peter and Paul Fortress), satires by Saltykov-Shchedrin, and works by the so-called plebeian authors (Vasili Sleptsov, Fyodor Reshetnikov, Gleb Uspensky). The magazine was closed down in June 1866, due to the official panic that followed the first attempt on Alexander II's life. After that, Nekrasov and Saltykov-Schedrin acquired the rights to publish the Otechestvenniye Zapiski (Notes from the Fatherland), a literary journal widely viewed as the Sovremennik's successor. After leaving Sovremennik, Saltykov-Shchedrin entered the civil service. On his return to St Petersburg he was quickly promoted to administrative posts of considerable importance. After making a report on the condition of the Russian police, he was appointed deputy governor, first of Ryazan and then of Tver. His predilection for literary work induced him to leave the government service, but pecuniary difficulties soon compelled him to re-enter it, and in 1864 he was appointed president of the local boards of taxation successively at Penza, Tula, and Ryazan. In 1868 he finally quit the civil service. 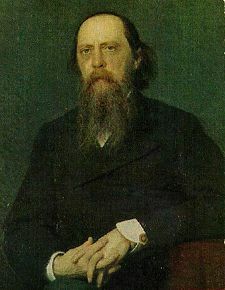 Subsequently he wrote his principal works, namely, The Old Times of Poshekhonye, which possesses a certain autobiographical interest, The History of One Town, a satirical allegory of Russian history, Messieurs et Mesdames Pompadours; and his only novel, The Golovlyov Family (also translated as House of Greed). The latter work, often considered Saltykov's masterpiece, is a penetrating study of overpowering greed. In his eighties, Saltykov remained a last remnant of the heroic age of reform and progress, universally venerated by all the advanced intelligentsia. His last publication was an applauded collection of satirical fables and tales. He died in St Petersburg and was interred in the Literary Cemetery. "The sole object of my literary work," wrote Saltykov-Shchedrin, "was unfailingly to protest against greed, hypocrisy, falsehood, theft, treachery, stupidity of modern Russians." The greater part of Saltykov's work is a rather nondescript kind of satirical journalism, for the most part with no narrative skeleton, and intermediate in form between the classical "character" and the contemporary feuilleton. Enormously and universally popular though it was in its own time, it has since lost much of its attraction simply because it satirizes social conditions that have long ceased to exist and much of it has become unintelligible without comment. In 1869-70 The History of a Town appeared, which sums up the achievement of Saltykov's first period. It is a sort of parody of Russian history, concentrated in the microcosm of a provincial town, whose successive governors are transparent caricatures of Russian sovereigns and ministers, and whose very name is representative of its qualities–Glupov (literally, Sillytown). Most works of Saltykov's later period are written in a language that the satirist himself called Aesopic. It is one continuous circumlocution in view of the censorship and demands a constant reading commentary for the contemporary reader to understand. The style, moreover, is deeply rooted in the bad "journalese" of the period, which goes back to Osip Senkovsky and which today invariably produces an impression of painfully elaborate vulgarity. The Golovlyov Family was described by D.S. Mirsky as the gloomiest book in all Russian literature—all the more gloomy because the effect is attained by the simplest means without any theatrical, melodramatic, or atmospheric effects. The most remarkable figure in this novel is Porfiry Golovlev, nicknamed Little Judas, the empty and mechanical hypocrite who cannot stop talking unctuous and meaningless humbug, not for any inner need or outer profit, but because his tongue is in need of constant exercise. It is one of the most terrible visions of ultimately dehumanized humanity ever conceived by an imaginative writer. ↑ 1.0 1.1 D.S. Mirsky. A History of Russian Literature. Northwestern University Press, 1999. ISBN 0-8101-1679-0. Page 294. This page was last modified on 5 October 2018, at 14:48.